↑ "Common Names for Malabar Nut (Justicia adhatoda)". Encyclopedia of Life. สืบค้นเมื่อ 3 January 2013. ↑ Aslam, Mohd; Rais, Sumbul; Alam, Masood; Pugazhendi, Arulazhagan (2013). "Adsorption of Hg(II) from Aqueous Solution Using Adulsa (Justicia adhatoda) Leaves Powder: Kinetic and Equilibrium Studies". Journal of Chemistry. 2013: 1–11. doi:10.1155/2013/174807. ISSN 2090-9063. 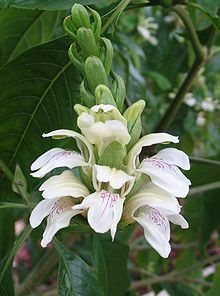 ↑ 3.0 3.1 3.2 3.3 "Facts about for Malabar Nut (Justicia adhatoda)". Encyclopedia of Life. สืบค้นเมื่อ 3 January 2013. หน้านี้แก้ไขล่าสุดเมื่อวันที่ 27 กันยายน 2561 เวลา 23:12 น.